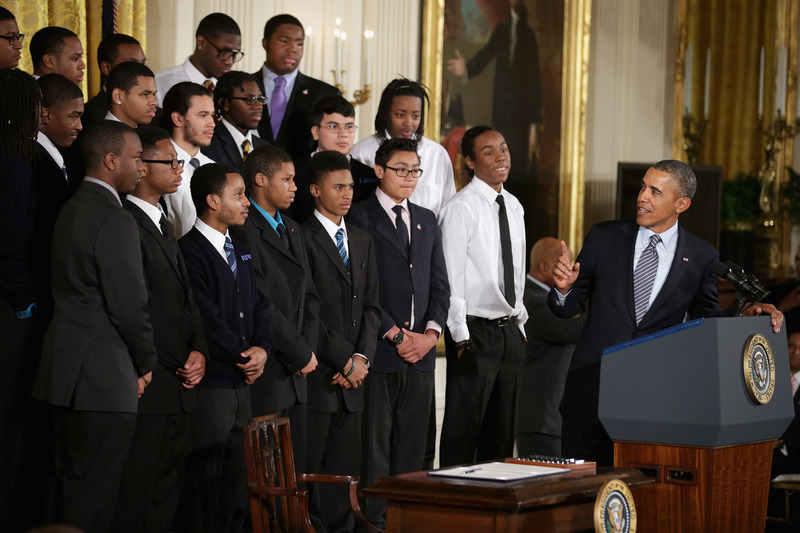 In the wake of the tragic death of decorated 25-year-old NYPD officer Brian Moore and the civil unrest in the embattled city of Baltimore, President Obama on Monday unveiled a new nonprofit aimed at helping young men of color create more opportunities for themselves. The new organization, My Brother's Keeper Alliance, will be an offshoot of the president's My Brother's Keeper, the program he established in February 2014 to help bridge the educational gap for minorities, he explained in the Bronx on Monday. The program aims to close the distrust between young black and Hispanic men and the police who serve their communities — a historic push meant to repair the wounds inflicted by police brutality reports and officer slayings. "That sense of unfairness, and of powerlessness, of people not hearing their voices, that’s helped fuel some of the protests that we’ve seen in places like Baltimore, and Ferguson and right here in New York," Obama said to a large audience at Lehman College. "In too many places in this country, black boys and black men, Latino boys and Latino men, they experience being treated differently by law enforcement." Obama indicated that as he approached the end of his tenure in the White House, both he and Michelle would focus their efforts largely on working with the new nonprofit. We see ourselves in these young men. I grew up without a dad. I grew up lost sometimes and adrift, not having a sense of a clear path. The only difference between me and a lot of the other young men in this neighborhood and all across the country is that I grew up in an environment that was a little more forgiving. He added that the foundation would initially serve to assist nearly 300,000 men of color with future plans of helping at least 5 million. The new effort comes on the heels of a painful year in which a handful of high profile cases involving young black men killed by police peppered the headlines. Family members of the deceased have since gone out of their way to decry the allegedly biased system that obstructs the few who make it past the diploma ceremony into the real world. "Do you know how hard it was for me to get him to stay in school and graduate?" said Lesley McSpadden, mother of Ferguson teen Michael Brown who was shot and killed by police officer Darren Wilson in August 2014, in an emotional statement to reporters last fall. "You know how many black men graduate? Not many," she lamented. The new nonprofit will serve to construct a healthier dialogue that addresses the issue of police brutality and racial profiling in a way that doesn't ignite already fiery tensions. "If we ask the police to simply contain and control problems that we ourselves have been unwilling to invest and solve, that’s not fair to the communities, it’s not fair to the police," said Obama on Monday. According to The New York Times and nonprofit organizers, financial backing for the alliance will stem from companies like American Express, Deloitte, Discovery Communications, and News Corporation, and will be used to provide grants to young men through various community programs.